Good Sunday morning, folks! I hope everyone has had a fantastic week, and is enjoying the weekend. So, guess what? It is going to rain! I know you are thrilled with the news, so lets hop on into the forecast. You may already be thinking, “Well, no duh Pierce it is going to rain. It already is!” I know this, but it is going to rain some more. Yep, after multiple rounds of rain this past week, we are in for some more. You may hear some sleet mix in with the rain as it overspreads the region, but it won’t be impactful. Just something to remind you that the season we’re in is still Winter. In addition to the rainfall, a warm front will move to our north, shifting our winds out of the south. Don’t get too excited, though. Temperatures aren’t gonna get too warm. Highs today will only be in the low to mid 40s. This evening, our main event will begin to set up. A Flood Watch will go into effect at 6 pm, and we’ll see a stationary boundary/warm front set up from western TN through southeastern KY. These will be mundane days, for sure, but there is significant concern regarding these two days. We have already had significant rainfall lately, and we’re now looking at 2-4″ more through Tuesday. 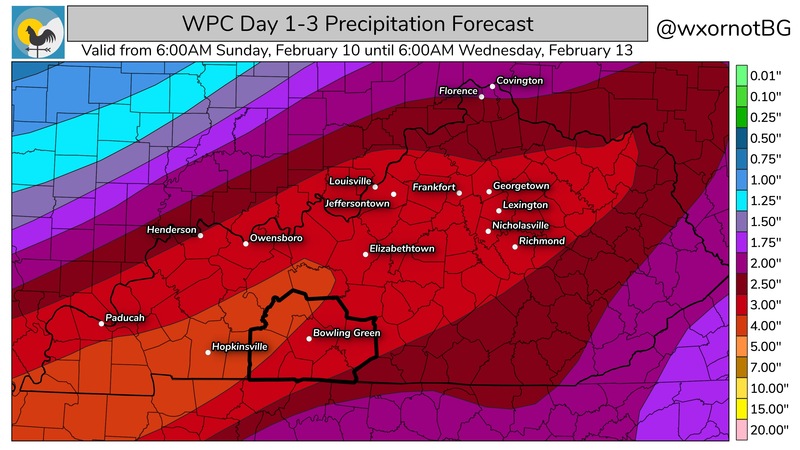 The WPC forecast for rainfall is not a welcoming sight to rain-sore eyes. 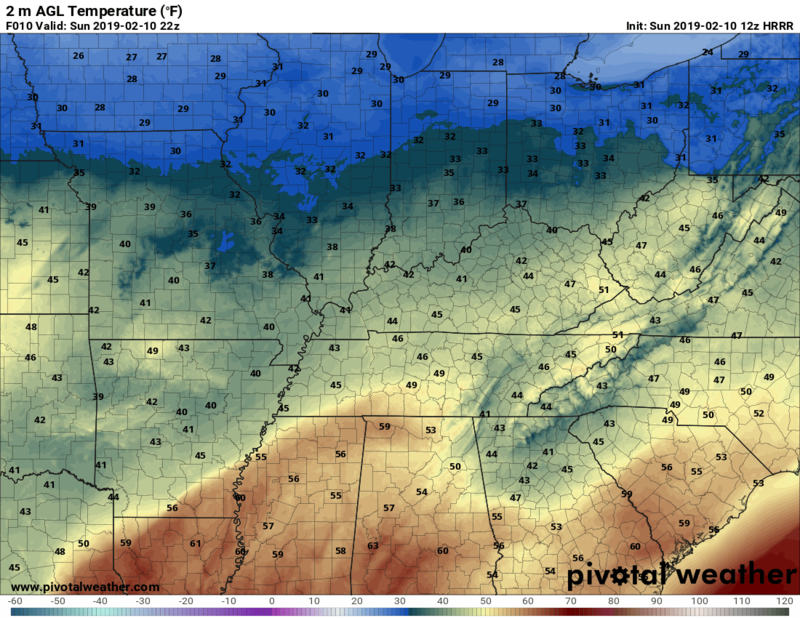 So, the warm/stationary-ish front is expected to set up along the KY/TN border, and gradually move northward on Monday. It’ll really push northward as a surface low develops to our west, and propagates into the central OH Valley. Along this from Sunday night through Monday night, we’re expecting multiple rounds of heavy rain to occur. There should be a break on Monday evening behind the warm front, and temps will rise fast. The high Monday should be in the upper 50s and lower 60s near 11:59 pm. 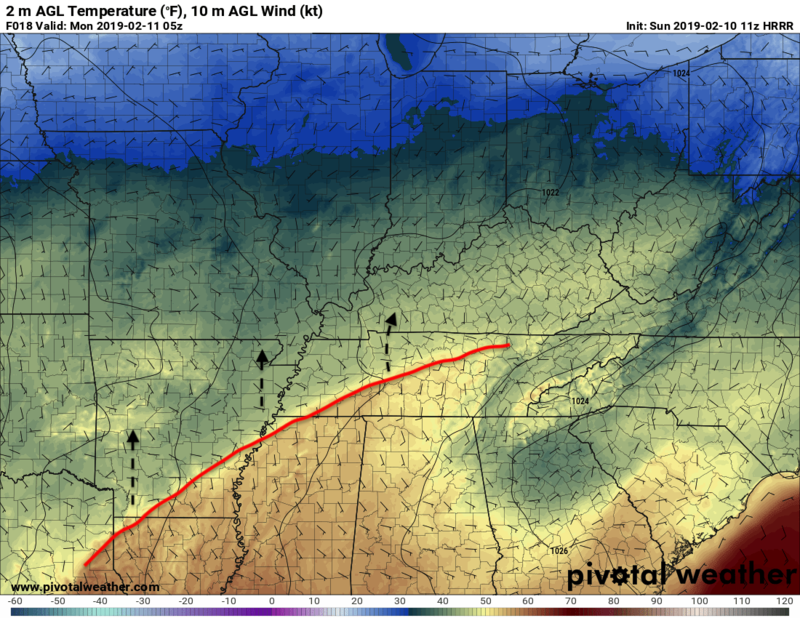 Once this happens, we’ll be in the warm sector ahead of a stout cold front on Tuesday. This is expected to move through during the morning hours, so expect temps to crash from the mid 50s in the morning to the mid 40s in the afternoon. Ahead of this, another area of heavy rainfall is expected to move through along the front. With copious moisture for this time of year, anticipate very heavy rainfall again. It’ll likely be pretty breezy ahead of, and behind, the cold front on Tuesday, so prepare for that as well. All in all, this is fairly similar to what we’ve experienced lately. Wednesday looks chilly, but we’ll be warming up again in this cold-warm pattern. Our next rain-maker looks to roll in on Friday. Normally I wouldn’t do this, but we are really in a favorable pattern for significant river flooding at some point within the ear future. 2-4″ of widespread rain in a couple of days will only exacerbate things. The Green River is already at Minor Flood Stage at many areas in Warren County, and it is expected to continue rising. It is at Moderate Flood Stage just into Ohio County north of Butler County. This rain means business, folks. If you see flooded creeks and streams (it’ll be easy for them to rise quickly right now), please avoid them as much as possible. Well, that is all I have, folks! 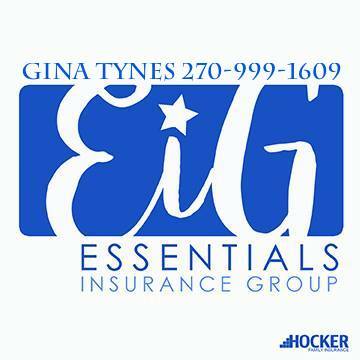 Have a fantastic Sunday, and be sure to pack an umbrella anywhere you go! Follow @wxornotBG on Twitter/Facebook for the latest.